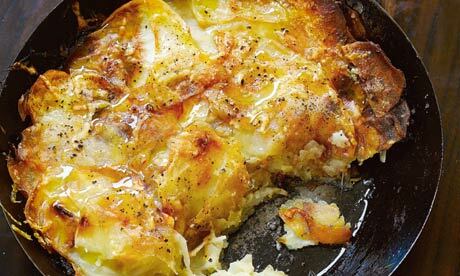 Hugh Fearnley-Whittingstall’s Northumbrian take on the delicious combination of potatoes, onions and cheese. He suggests serving it with a crisp green salad, and some simply cooked pulses. Heat the oven to 190C/375F/gas mark 5. Melt half the butter in a 20-25cm ovenproof frying pan over a medium-low heat and fry the onions for about 15 minutes, until soft and golden. Meanwhile, peel the potatoes and slice them very thinly (use a mandoline or the slicing side of a box cheese grater).